For ease of ordering, just click on one of the book covers pictured in the blog footer at the bottom of the page. And, as always, I deeply appreciate your comments, and your reviews! Watch for the audiobook edition of Corridor of Darkness coming this fall, and Fulcrum of Malice, the final novel in the series, coming in May 2015. This entry was posted in European Travel, Historical Thriller, Uncategorized and tagged 1930's Berlin, 1930's Germany, 1930's Thriller, 1940's France, 1940's Germany, Espionage, French Resistance, Gestapo, Historical Thriller, Nazi Germany, Nazi Thriller, Occupied France, Third Reich, World War II. Bookmark the permalink. 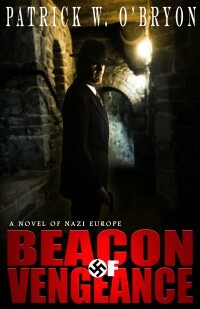 11 Responses to BEACON OF VENGEANCE, A Novel of Nazi Germany, CORRIDOR OF DARKNESS Volume 2, NOW AVAILABLE! Patrick O’Bryon’s “Corridor of Darkness” was one of the best books I have read in recent years. Book 2: “Beacon of Vengeance” is now available and I expect it to be of as high a caliber as the first. Pick up your copy today! Thanks for spreading the word about the new Ryan Lemmon adventures! It means a great deal to me to have a writer I admire so enthusiastic! Congrats on launch! When can I order hard copy from Amazon? Who is the guy on cover? Nice tie in to Donovan. Did the ring make it to publication? Len, thanks for the congrats! Print version is available right now on Amazon; they just haven’t linked the ebook and paperback editions yet. Just go to Amazon.com, enter “Beacon of Vengeance” in the search box, then click on “in books” and it will come up about fourth book down. Once you’ve read the story you should know who the cover character is, and yes, the famous ring photos appear in the Afterword. While I’m taking a sort of break from blogging and most things technology, there are certain things I do need to do … and that’s promote my favorite self-published authors. Patrick O’Bryon holds a spot at the top of the list. One of the most well-written and produced self-published authors I’ve seen. 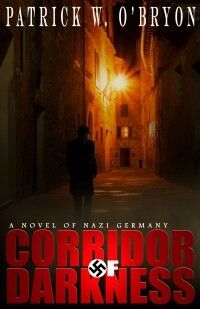 Here’s the second book in his World War II spy thriller trilogy. Buy the first, then read this one. I’m pretty sure you won’t be disappointed at Patrick’s work — the quality of which all of us independent authors should be aspiring to. I deeply appreciate the enthusiasm and support from such a creative and gifted writer, Mark. Thank you! Pat, you were right! Fantastic cover!!!! Thanks, Roy. Glad you like it!